For Charlie, it seemed to come out of nowhere. A bright white flash, a tearing crack, and metal whipping past, inches from his face. But riding several metres behind him and wondering whether this could actually be hapenning, I saw it all. The day so far had all gone to plan. Having stayed in Prea for our penultimate night of travelling, we had planned to enjoy the last twelve kilometres on the way to our final destination, Jericoacoara. And enjoy it we did – racing along the huge beach in perfect winds with the largest Frenzy kites we could handle and crashing exuberantly through small streams. 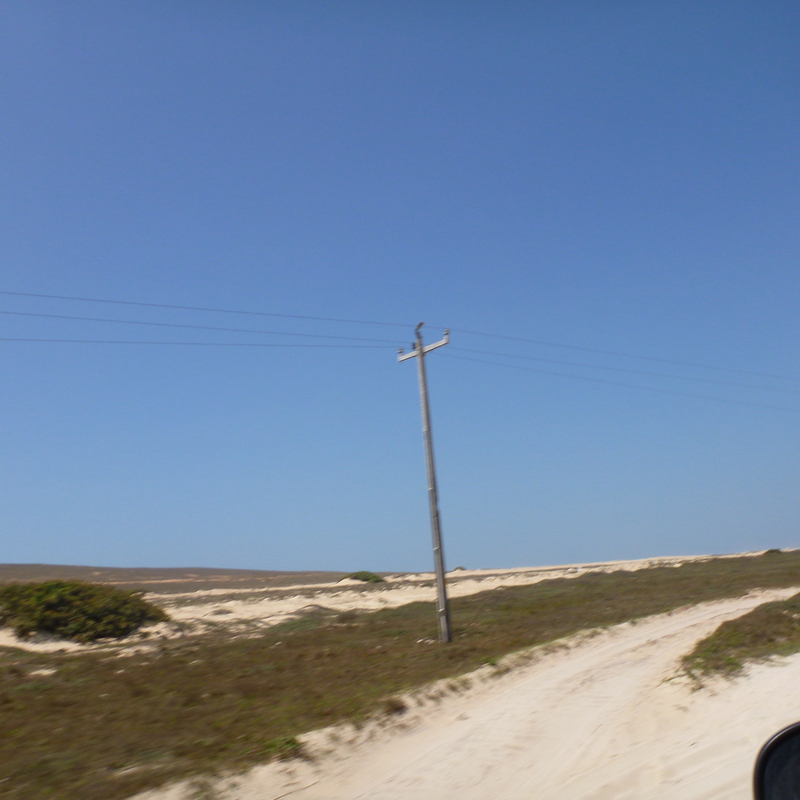 With the famous sunset dune at Jericoacoara in sight we were excited to be nearly there. Seeing the last rocky headland approaching, we veered onto the marked sand track that serves as the main ´road´ into Jeri. We had been advised that this was the best route, but the bumpy narrow track and strengthening wind made for some exciting kite buggying, especially as we were now sharing it with motorbikes and 4x4s, and had to keep to the right hand side of the road. We were about a kilometre away from Jericoacoara. Charlie was just ahead of me. With the late afternoon sun in both our eyes, he was focussing on an approaching blind corner and lowering his speed to make sure he avoided any incoming traffic. He wasn´t looking at his kite. 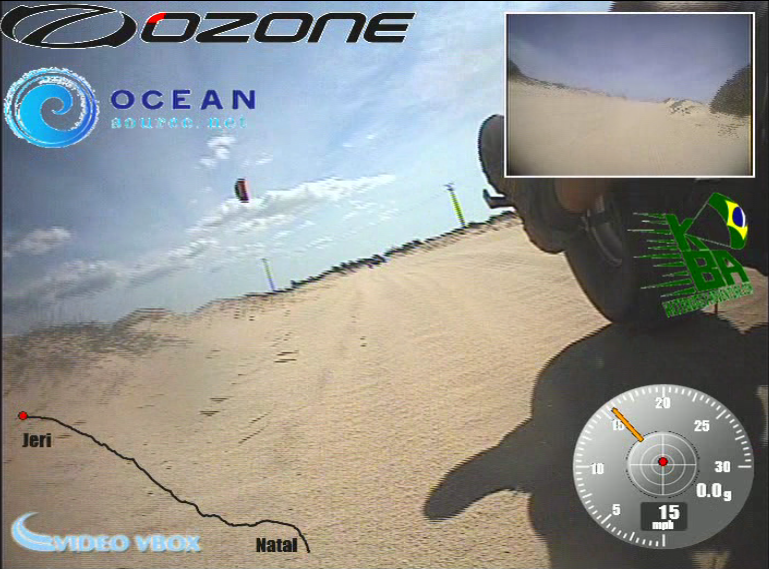 Neither of us were – after a while looking at your kite is like staring at your accelerator pedal while driving. While Charlie watched for traffic, I suddenly noticed a set of power lines approaching, obscured by the sun and the shadow of a hill. I yelled out. Too late – his lines hit the electric cables at such speed that two of the three cables connected. A blinding flash, a high pitched hum of hot metal, and one of the cables broke, the end whipping past Charlie´s face and hitting the ground. We both paused for half a second, in shock, as the fallen cable set light to a pile of donkey manure. Vehicles approached from behind us, and not knowing quite what to do we began directing them around the area we thought was dangerous, rolling up the kites and putting sand and rocks over the exposed cable. We got the buggies out of the way, sprinting with them up the side of a hill. Having got a local to call the power company and police Charlie waited for them to arrive while I ran into Jericoacoara to find our accomodation. Candles illuminated dimly lit rooms. Shop assistants emptied out water from fast thawing freezers. Ceiling fans hung still in the thick atmosphere. The streets were black and lit only by passing motorbikes and dune buggies. Having found our apartments, I rushed back to find Charlie, worried that he may now be being questioned. However the police had still not turned up, so we decided to continue into Jericoacoara. Not quite the entrance we were expecting, but we were glad no-one had been hurt. The lights went up in the town a few hours later with a cheer from the locals and we were able to see the area properly. Standing on the terrace of the beautiful Serrote Breezes apartments in their own banana tree and palm gardens (arranged by Oceansource.net), it felt strange to have finally finished the journey. Every day had had its own challenges and adventures and felt like the end of a journey in its own right, and this day was like no other – albeit with a slightly more dramatic challenge than usual! This entry was posted in Journal and tagged apartment jericoacoacoara, kite buggy accident, kite power lines, kiting accident, prea, serrote breezes, windsurf jericoacoara by Harry Thuillier. Bookmark the permalink. Yeow! The force was with you! Talk about finishing with a BANG! Haha thanks Richard – just lucky no-one was hurt! I guess they knew you had arrived!!! Great adventure guys well done. They certainly did! Thanks for all your support Craig, and the PLK Outlaw buggies really were incredible.